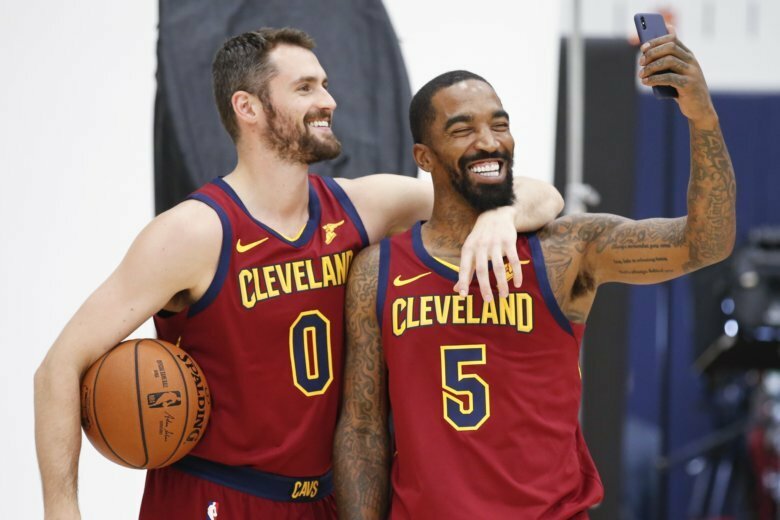 INDEPENDENCE, Ohio (AP) — As the Cavaliers wandered around posing for silly photographs, reading radio promotions and doing interviews, everything felt different. This media day was nothing like the past four. Cleveland heads into the season with very little buzz, zero drama and low expectations. The spotlight, which has illuminated the Cavs in recent years, is pointed elsewhere. LeBron James left and it all went with him. “I’m still here,” coach Tyronn Lue said, laughing. The Cavs began life without James in earnest on Monday, taking their first steps since the superstar signed with the Los Angeles Lakers this summer and promptly ended the greatest run in franchise history. Without James, Cleveland has tumbled from an elite team and title contender to one many believe isn’t good enough to make the playoffs. However, Lue doesn’t believe the Cavs are starting over. The Cavs likely won’t regress to where they did when James bolted for Miami in 2010, but it could be a long time before they’re competing for a championship. “When you have the best player in the world who has dominated this game for the last 12 or 13 years in LeBron, it’s always tough to lose a player like that,” Lue said. “But moving forward, talking to (owner) Dan (Gilbert) and how he sees us building and approaching this season of being a playoff team. That’s easier said than done, but Cleveland still has some talent led by All-Star forward Kevin Love, who signed a four-year, $120 million contract extension this summer and is now the Cavs’ best player and No. 1 offensive option. It’s a new, yet familiar role for Love, who was Minnesota’s franchise player before he was traded to Cleveland and joined forces with James and Kyrie Irving. Four years ago, Love stood side by side with James and Irving on media day as the Cavs’ “Big Three” were introduced to the world before embarking on a journey that led to a title in 2016. That run seemed more of a distant memory on Monday as Love smiled and posed next to Lue and rookie guard Collin Sexton. And perhaps as a nod to his former teammate, Love wore a pair of James’ signature sneakers. He certainly won’t try to fill his shoes. Love, like all the Cavs, will have to adjust his game now that James isn’t around. But that doesn’t mean Love will revert to being the bruising big man he was with the Timberwolves. Kyle Korver feels refreshed. Following a personally challenging season, which included his younger brother’s death, the 37-year-old walked out of Quicken Loans Arena following the Game 4 loss to Golden State in the Finals unsure of his future. While James is gone, reminders of him hang inside Cleveland Clinic Courts, where one wall is lined with Central Division and Eastern Conference championship banners. There’s also one to commemorate the ’16 title, which ended the city’s 52-year championship drought. It might be some time before the Cavs contend for another, but while he may have lost the best player he’ll ever coach, Lue isn’t convinced there’s a better team in the East. “We haven’t lost yet, have we?” he said.